FRANK LLOYD WRIGHT is best known as a revolutionary American architect. A hallmark of his work is sensitivity to the natural environment—Fallingwater, the house he built over a waterfall, is a prime example. But Mr Wright had a second career as a collector of and dealer in Japanese block prints, continuing this business until his death in 1959 at the age of 91. At times, he made more money selling prints than he did from architecture. A small but insightful exhibition at the Art Institute of Chicago, comprising prints, architectural drawings from Mr Wright’s studio and archival objects, highlights the Japan’s deep influence on his work. Mr Wright was first captivated by Japanese art in 1893, when he saw Japan’s pavilions at the sprawling world fair in Chicago. His interest in Japan’s art and culture blossomed during several trips there starting in 1905. He opened an office in Japan in 1915 and lived there for a few years while building the Imperial Hotel in Tokyo. “At last I had found one country on earth where simplicity, as nature, is supreme,” he wrote. He returned from his first trip to Japan with hundreds of ukiyo-e prints, planning to sell them in America. Mr Wright often sold his clients art to hang on the walls he had built, explaining that they complemented his streamlined interiors. Japanese prints, especially traditional bird and flower images, had easily understandable motifs. According to Janice Katz, associate curator of Japanese art at the Art Insitute of Chicago, Mr Wright favoured prints by Utagawa Hiroshige, a Japanese artist who emphasised environment over human structures. 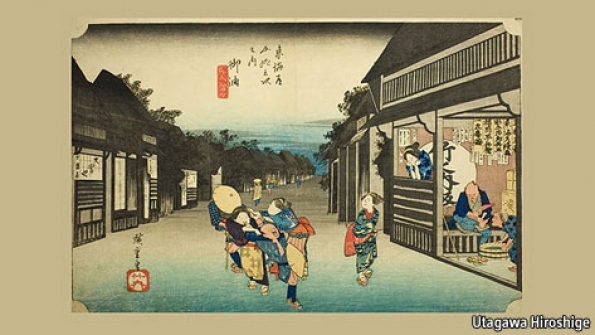 Prints such as Mr Hiroshige’s “Goyu: Women Stopping Travellers” (pictured above) show buildings from a wide perspective. The flattened space and naturalistic detail of prints influenced architectural drawings in Mr Wright’s studio. For instance, a vertical scroll-like drawing called “Perspective of Frank Lloyd Wright’s Thomas P. Hardy House, Racine, Wisconsin” leaves most of the brown page blank except the top right corner where a house perches precariously. A flowering branch, like those in bird and flower prints, pokes into the blank space. The draft was made by Marion Mahony Griffin, who worked for Mr Wright. An architect in her own right, Ms Griffin later incorporated elements of Japonism in own work. Another drawing, “Perspective View of Marion Mahony Griffin and Walter Burley Griffin’s Rock Crest/Rock Glen, Mason City, Iowa” (pictured right), shows clouds and buildings nestled among lush foliage. It is rendered in gouache on a horizontal slice of pale green satin with two side panels that echo Japanese hand scrolls. Mr Wright was also influential in cultivating American interest in Japanese prints. In 1906 he exhibited his collection of Hiroshige prints at the Art institute. Two years later he loaned several pieces to the institute for what Ellen Roberts, associate curator of American art at the institute, reckons was the largest display of Japanese prints in America at the time. Mr Wright designed the installation for that exhibition, including sleek furniture and special frames reminiscent of screens.